The Naas Felt & Fibre group are holding their annual exhibition from next Tuesday 26th November – click here for your invitation. Everyone welcome. If you are in Dublin between now and 24 November you should go to see an exhibition of our members, Joanna Kidney. She works with felt in a unique and imaginative way. RHA Atrium, 5 Sept-24 Nov. Drawing plays a central role in Joanna Kidney’s practice. It is drawing’s inherent characteristics; immediacy, open endedness, spontaneity, technical diversity and rawness, that pull Kidney back again and again to make drawing based work. Dig, undig, redig focuses on the expansion of drawing in a space. It presents two works: Everything and everywhere, a wall based assemblage comprised of over a thousand felt forms and monotypes on paper and Naveander, a linear, constructed drawing utilising corner, wall and floor. An intuitive engagement with the material and process of felt, the oldest form of fabric known to mankind, is fundamental to this work. Notions of the relationship between the subconscious, memory and intuition are raised rather than conclusions sought. With an open-ended approach to making spatial drawings, Kidney seeks out the vitality of the artwork; digging to both create and reveal it. 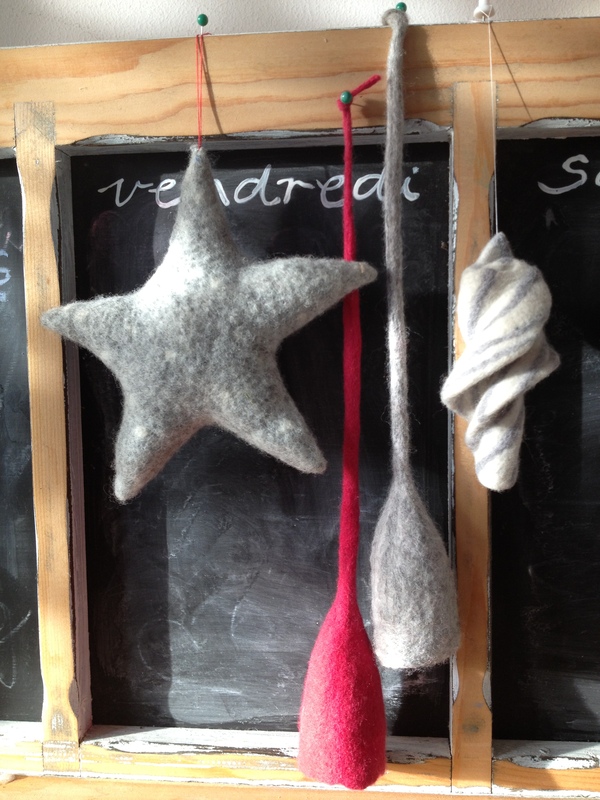 This Sunday we will be looking at some interesting and quirky Christmas decorations – it may be only November but it’s time to get working on all those felted Christmas gifts. Our quarterly magazine arrived in the post this morning. The front and back covers show a collage of many of the international tutors who have visited Ireland and shared their skills with us over the past 10 years. Our magazine is full of information about all aspects of feltmaking in Ireland and beyond including a list of suppliers of feltmaking materials. The magazine is posted to all our members quarterly. Membership costs €25 annually and has many other benefits as well as the magazine and is excellent value. Congratulations to our valued committee member, and the designer of the magazine, Gina Faustino, who gave birth to a beautiful baby boy three week ago – and still managed to complete work on the layout! Congratulations also to dad Aonghus and big brother Elias. Anyone interested in taking part in our Basic & Beyond workshop can open and print the application form and send it off to Maureen with a cheque, all the details are on the form. It’s a busy and creative day shared with lots of enthusiastic feltmakers. All materials for the day are supplied . It would make a lovely Christmas present for someone.